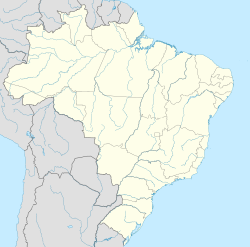 Itatiaia (Portuguese pronunciation: [itɐtʃiˈaj.jɐ]) is a Brazilian municipality of the state of Rio de Janeiro. It is located at an altitude of 390 meters. Its population was 29,996 in 2014 and its area is 224.96 km². The oldest Brazilian national park, Parque Nacional do Itatiaia (PNI), is located in the municipality. The municipality also contains part of the 8,036 hectares (19,860 acres) Pedra Selada State Park, created in 2012. Its history is more than 160 years, being 5 of April 1849 officially accepted as the date of its foundation, with the name of "Beautiful Field". There are ancient documents that record settlement in place for at least seven years from that official date. In Brazil Colony, the current territory of the municipality was inhabited by Tamoios, Puris and Coroados Indians. The presence of the white man only came in the Bandeirantes trail, the need for the gold to flow in Minas Gerais to the ports of Angra dos Reis and Parati forced the descent down the mountain in the route where Mauá exists today, or through Serra do Picu, where Itatiaia is today. The Lambert Almanac, dating from 1850, indicates that the region had been occupied in previous decades by the miners who, having exhausted the gold mines, would have definitely gone down the mountain looking for land where they could settle. 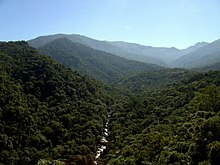 It was from this time that the largest farms in the region were formed, such as Cachoeira, Itatiaia, Belos Prados, Campo Belo, Serra da Fazenda, Fazendainha and Irineu Evangelista de Sousa, Barão de Mauá, the latter corresponding to current area of the Itatiaia National Park, with its forests preserved thanks to its owner not having adhered to the coffee monoculture. It was not until the beginning of the 19th century that the village of Campo Belo emerged with the installation of the District of Peace and Tabelionato in 1832. In 1839 the Ecclesiastical Curato of São José de Campo Belo was installed. Campo Belo was elevated to the village by Federal Law n. 311, of March 2, 1938. On December 31, 1943, Decree Law no. 1,056 gave the fourth district of Resende and Vila de Campo Belo the expressive name of Itatiaia. In the winter of 1985, snow was recorded in the National Park of Itatiaia (see Climate section for details). On 1 June 1989, Itatiaia became officially a municipality. Snow in the Itatiaia National Park in 1985, where the temperature in that year had a minimum record of -13 °C (8.6 °F). The urban center of Itatiaia is 505 metres (1,657 ft) high and the Pico of the Agulhas Negras, located in the National Park of Itatiaia, reaches 2,791.55 metres (9,158.6 ft). The average annual temperature in the urban region is around 19.1 °C (66.4 °F). In the winter, the average temperature in the urban area is 14 °C (57 °F), reaching up to 5 °C (41 °F). The minimum average temperature is 11.2 °C (52.2 °F) and the maximum average temperature is 22.1 °C (71.8 °F). The temperature in the mountains of Pico das Agulhas Negras can reach −4 °C (25 °F) in the winter. 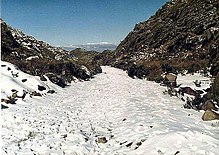 The minimum temperature record in the mountains of Pico das Agulhas Negras in Itatiaia National Park was in 1985 when thermometers marked −13 °C (9 °F) among an intense and memorable snowfall, which, over three days, accumulated more than 1 metre (39 in) of snow in the highest parts. Snowfall does not occur every year, as in some famous mountainous regions of the South, but the number of days in which negative temperatures are recorded in the upper parts of the mountain can reach up to forty a year. 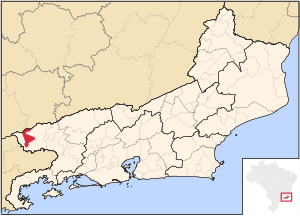 In the summer, the average temperature in the urban area of the municipality is 23.6 °C (74.5 °F), with a mean average temperature of 19.8 °C (67.6 °F) and a maximum average temperature of 30.1 °C (86.2 °F). According to data from the National Institute of Meteorology (INMET), the highest temperature recorded in the urban area of Itatiaia since 1961 was 39.1 °C (102.4 °F) on 1 March 1977. In Itatiaia, the visitor will find mountains, with great places for climbing and humid forests with waterfalls. In addition to the Itatiaia National Park, Itatiaia also has other tourist destinations, such as the Funil Hydroelectric Plant, owned by the state-owned Furnas Centrais Elétricas, the Finnish Colony of Penedo and the villages of Maromba and Maringá, both in the Visconde de Mauá region. 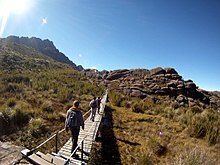 The Itatiaia National Park is a Brazilian conservation unit of integral nature protection located in Itatiaia, in the Mantiqueira mountain range, between the states of Rio de Janeiro and Minas Gerais. Itatiaia is the oldest national park in Brazil, and was created on June 14, 1937. The Agulhas Negras peak, with a height of 2 790.94 m, is the highest point in the state of Rio de Janeiro and the fifth highest in Brazil. Although it is located in a tropical zone, the peak usually registers negative temperatures during the winter and occasionally snow in years exceptionally more humid. Penedo is a neighborhood and ecological park of the municipality of Itatiaia. It is the main Finnish colony of Brazil, which still shows remarkable in the architecture of residences and commercial buildings, as well as in the local culture. Finnish immigration in Brazil was the migration movement in the twentieth century of Finns to the interior of the state of Rio de Janeiro, Brazil, where they created a settlement called Penedo at the foot of the Itatiaia National Park in the city of Itatiaia. Tourism in Penedo is a true vocation of Penedo, with a network of 52 hotels and 39 restaurants, snack bars and bars. The municipality of Itatiaia contains a system of public and private education, with twenty municipal schools, one state school, and five private schools. The ostensible policing of the city is carried out by the 2nd Company of the 37th Military Police Battalion of the State of Rio de Janeiro (37º BPM / 2ªCia), with headquarters in the city center, counting Itatiaia, with a Community Policing Station in the region of Penedo. The Civil Police of the State of Rio de Janeiro maintains in the municipality the 99th Police Station (99th DP), subordinated to the 9th Regional Police Coordination of the Interior (9th CRPI). The city also has a Civil Defense team, to monitor and assist the population in the event of natural disasters, as well as maintains a Municipal Guard, responsible for monitoring the public patrimony and organizing the traffic in the city. It was inaugurated by the Rio de Janeiro State Fire Brigade (CBMERJ), on July 27, 2016, at 1:00 p.m., an operational unit in the municipality of Itatiaia. The headquarters has a hybrid vehicle and a staff of 24 soldiers. The unit is located between the Municipal Hospital and Maternity Dr. Manoel Martins de Barros and the 99th Police Department, in the neighborhood of Jardim Itatiaia. There are 2,615.48 square meters of land, which were ceded by the Itatiaia City Hall, with 407 square meters of total constructed area. The work, financed with resources of the fire rate, received an investment of R $647 thousand. The unit is commanded by Lieutenant Colonel Mauro Junior and is subordinate to the 23rd GBM - Resende. The barracks is 4.7 kilometers from the entrance of the Itatiaia National Park, which will enable faster rescue of forest fires.